Starlings, Jo Walton (Tachyon 978-1-61696-056-8, $15.95, 288pp, tp) January 2018. In the introduction to her first collection of stories and poems, Starlings, Jo Walton tells us that she didn’t really figure out how to write short stories until after her award-winning Among Others was published in 2011, and that her earlier efforts “were either extended jokes, poems with the line breaks taken out, experiments with form, or the first chapters of novels.” She later allows that there are two “actual short stories” in the volume, which turn out to be “Sleeper” and “A Burden Shared”. Both are solid pieces developed from solid SF ideas: in “Sleeper”, a biographer of a Kim Philby-era BBC director reconstructs the subject’s avatar from available data in order to interview him and possibly settle the question of whether he was a Soviet spy (we saw a very dif­ferent use of a similar idea in Singh’s “Somadeva: A Sky River Sutra”); while “A Burden Shared” centers on long-divorced parents who, through a vaguely explained “app,” are able to save their grown daughter from constant pain (caused by a chronic illness) by experiencing the pain for her, on predetermined schedules. It’s a notion that works better as a conceit for exploring fam­ily bonds than as a speculative idea, and Walton knows how to make effective use of it. But if those are the only two genuine short stories, then what are we to make of the other 18 prose pieces and 16 poems collected here, along with one play? 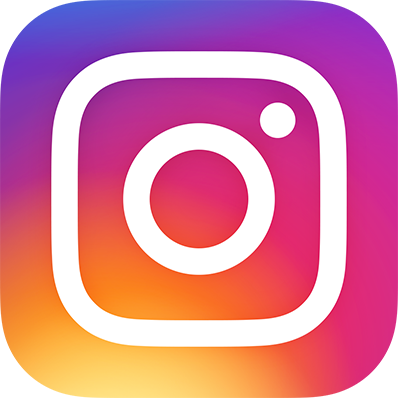 Well, for one thing, as we can also learn from recent collections by M. John Har­rison and Carmen Maria Machado, a good deal can be done with short-form fiction beyond the traditional well-formed short story. There is, for example, the imaginary book review (something Harrison experimented with), represented here by the short and very waggish “The Need to Stay the Same”, in which a disembodied intelligence is losing patience with a series of novels about humans, who are tiresomely bound to physical form. 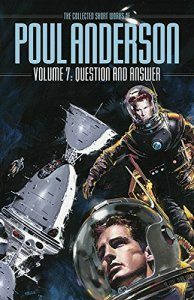 Chapters of unwritten novels – or perhaps just as accurately, implied novels – include “Turnover”, which describes in very humane and believable terms a key decision point in a genera­tion starship tale, and “Relentlessly Mundane”, in which characters returned from a fantasy world adventure discover that saving the real world is a much more complicated proposition. Point of view experiments include “On the Wall”, from the viewpoint of Snow White’s mirror; “What a Piece of Work” – actually narrated by Google! 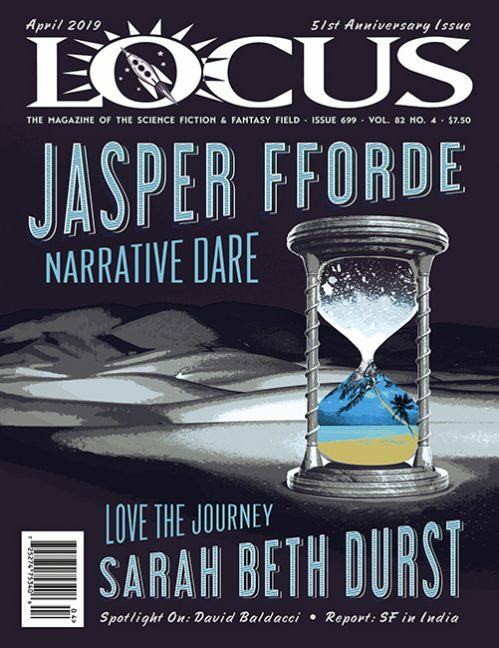 – and “Escape to Other Worlds Through Science Fiction”, which borrows the Dos Passos (and Brunner) technique of splicing headlines and ads (including ads for SF magazines) into a rather chilling dystopian narrative set in the world of her Small Change series of novels. “Extended Jokes” include variations on folkloric chestnuts such as a mysterious family tradition of cutting the ends off hams and that throwing-starfish-back-in-the-sea business that probably started with a Loren Eiseley essay but ended up as an annoying motivational poster. Thankfully, Walton turns the starfish into jellyfish, giving the story an edge it badly needs. There’s even an epistolary tale in which one of Jane Austen’s letters somehow gets delivered to the wrong Cassandra. 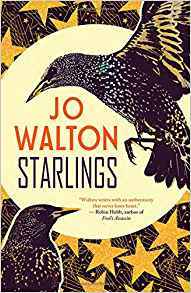 All this may suggest that Starlings is some­thing of a farrago, and it is – an entertaining if often uneven look into the mostly lighter side of Walton’s imagination. But Starlings also displays Walton’s formidable erudition, and her fascination with the various forms stories can take. When she deals with folkloric or mythical materials, she can evoke the haunting rhythms of the told tale, as in the three elegantly interwoven stories that make up “Three Twilight Tales” – the most structurally complex piece here – or turn the tale of the Bacchae into a small-town drama told in Kiplingesque rhymes. The longest piece in the book, “Three Shouts on a Hill”, is a hilariously manic quest tale in dramatic form, as three hapless sons of an Irish lord try to atone for more-or-less inadvertently murdering the king’s father, an adventure which eventually involves African, Incan, and Japanese gatekeepers, not to mention the King of the Cats, the Pope, and Oliver Crom­well. “Three Bears Norse” retells Goldilocks as a Norse skald might have told it, complete with kemmings and caesuras. 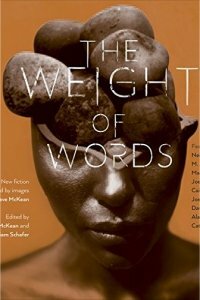 As might be evident by now, even though readers might be tempted to skip over them, the poems in this collection are as important to understanding Walton’s approach to story as they were in Jane Yolen’s recent Tachyon collection. The simple fact that one sequence is titled “The Godzilla Sonnets” – which I won’t describe further – should give a good sense of Walton’s wandering, curious, and unique imagi­nation, and Starlings as a whole may be the most interesting anatomy of that imagination than we’ve yet seen in one volume.